PLEASE DELETE YOUR "DBM Interrupts" AddOn which is written by a terrible programmer who has no idea about Lua and pollutes global strings. LFG's New Testing WQ Feature. Inviting Nearby players automatically by monitoring nameplates. 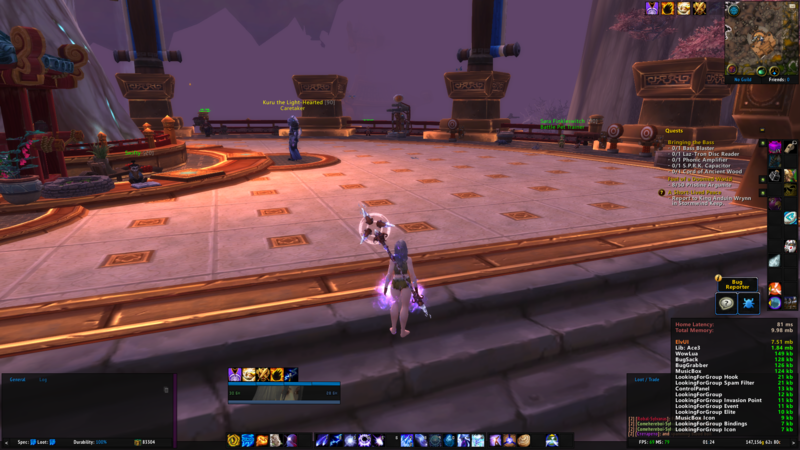 Unlike WQT, this addon monitors friendly nameplates instead of events. So you must enable friendly nameplates in order to make this feature work. Players who get invited must be in combat and not on the taxi. The feature won't work in resting areas and you must be the leader of your LFG group. If you find this feature still spams, please submit a ticket to me as soon as possible. 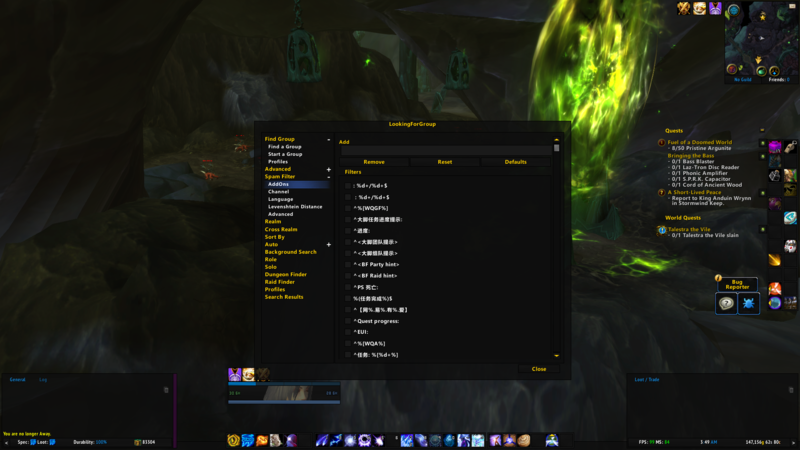 LFG is an LFG AddOn to replace the entire blizzard's LFG UI. It is designed to write by coroutines instead of events. Why should I use LFG AddOn? Just like why people are using 3rd-party raid frame addons like healbots, grid, grid2 etc because Blizzard's UI is basically lack of customization. A lot of things just can't be done within the framework of premade groups. You have to replace the entire Blizzard's UI with your own one if you want full customization. A lot of different types of add-ons are doing exactly the same thing. 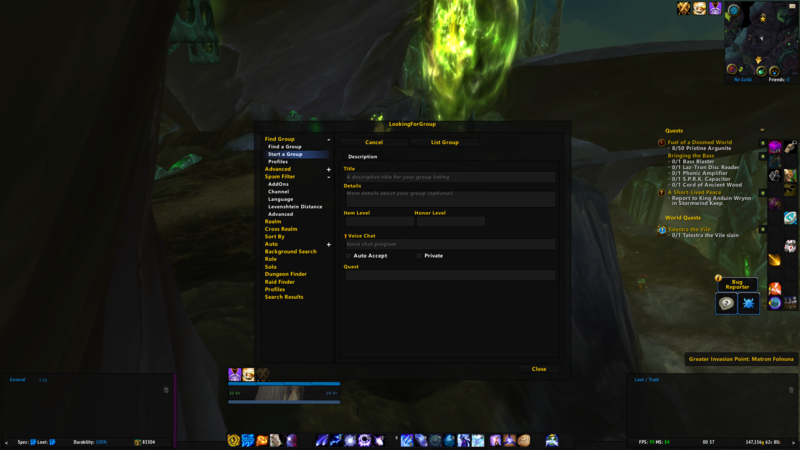 For example, Cross Realm Assist was a cross-realm addon but in fact, it is an LFG addon with its own UI. Serverhop and WQGF were doing exactly the same thing from the program logic perspective. Even Badboy as a chat filter addon would filter LFG spamming. The idea behind BlockChinese could actually be used for premade groups as well. There is no point for people to install so many different add-ons for doing exactly the same thing. These features should share the same code base and work together. Premade filter's dead and Chinese Netease Meeting Stone AddOn's spamming with disgusting titles and descriptions in LFG were why I started this project. I don't like these disgusting titles. I believe this is also why blizzard restricts C_LFGList APIs further in BFA, not because of the idea of WQGF. 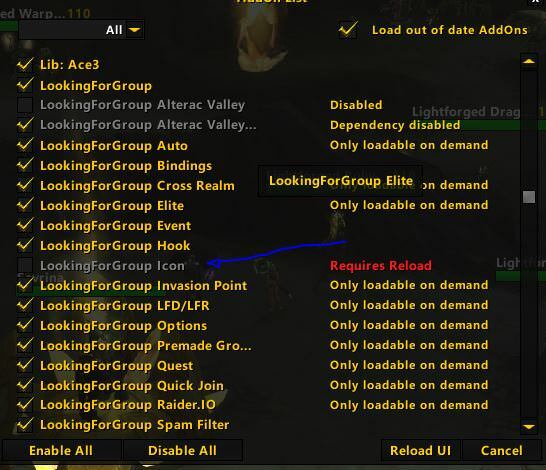 DO NOT DISABLE LFG HOOK AND LFG EVENT ADD-ONS IF YOU DON'T KNOW WHAT HOOKS AND EVENTS IN WOW ARE. DON'T DISABLE LFG AUTO TOO. These three add-ons should NOT be disabled. HOW TO USE LFG TO CREATE A GROUP? Just disable sub add-on in your addon list if you don't want the certain feature of LFG. 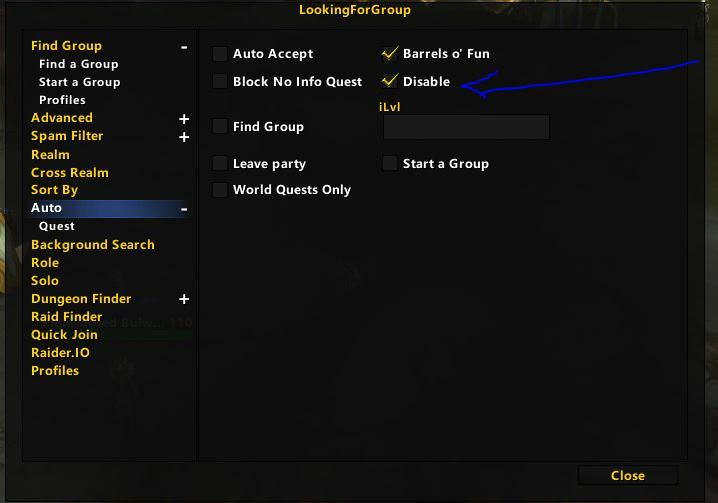 For example, you don't want to use LFG for the quest, just disable LookingForGroup Quest AddOn in your AddOn list. Do not worry about the resource usage of this AddOn. The sub addons are all "Load On Demand" which means they won't load unless the features being used. 1. How to disable LFG minimap icon? Just disable LFG Icon addon in your addon list. 2. How to disable quest popping up automatically? Or just leave quest range and LFG will close the pop-up. 3. 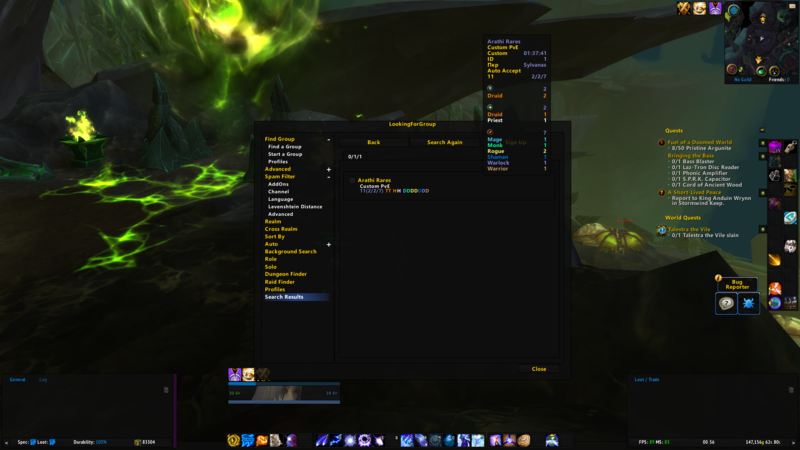 Where is my title bar in the premade groups UI? Since BFA, we have to break blizzard's UI to make this be functional. LFG does not have a "working" UI. The entire UI is all based on AceConfigdialog-3.0 with some dialogControl widgets. It won't cost many resources on UI unlike a lot of premade group add-ons do. 4. 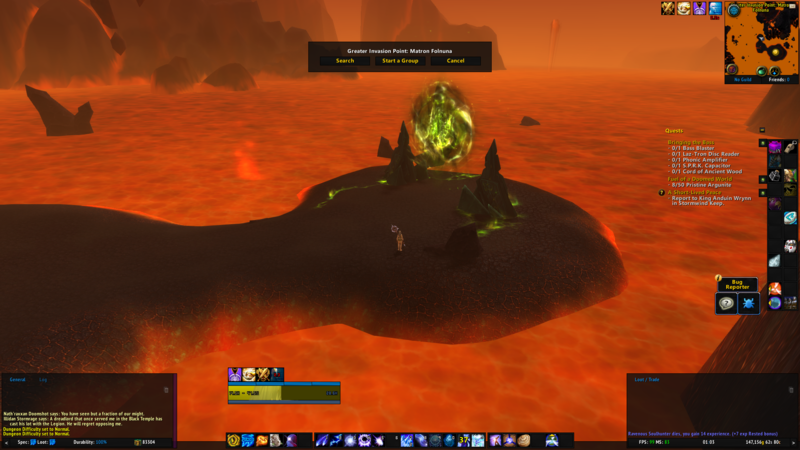 Q: Did you remove features like LFD/LFR, quick join, solo, Invasion Points and etc now? A: No. They are now separated into individual add-ons. You can't filter spamming based on title and description anymore. The answer is no. Sorry. Blizzard hates addon authors to modify their UI. AddOns like premade groups filter just taint blizzard's UI. Just like why people are using 3rd party raid frame addons like healbots, grid, grid2 etc. 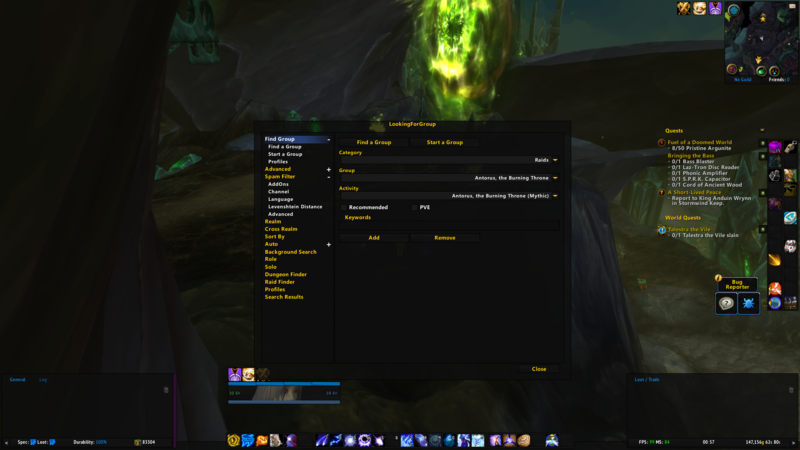 I was to put an addon to disable LFG AddOn features and only enabled WQ and cross-realm features for you. However, that addon works terribly and people would randomly download that addon which would make LFG dysfunctional. For example, LFG supports auto-accept/solo/mute features. Also, considering the hatred of activationblizzard towards addon community (like restricting LFG spam filter addons apis in 8.0 further), it would be even worse. You know spammers and bots are Blizzard's current largest sub base. Spam filter addons are a huge threat towards Blizzard's profit. It was just their excuse to blame WQ/hopping addons in order to break spam filter addons. The new community APIs are even protected and you have NO way to block community invitation by spammers. Here are all extensions you could use for LFG, including supporting Raider.IO, PGF scripts, LFD/LFR, solo, Invasion Point etc. I love your addon and I have been using it since BfA launched. It makes a lot easier to find the raids we want to join. However, since last week, its like 30 seconds after we click "search" to see the results. And the worse is, i dont see anyone queuing for my groups. My team members keep saying "hey, theres someone queued" but I see no one, neither get any warning. I turn the addon off, and voila, there they are, just like I was told. What could possibly be doing this? Elvui? i don't know:) better show screenshots. I believe you set something wrong. Try to delete your profiles. screenshots of what, exactly? 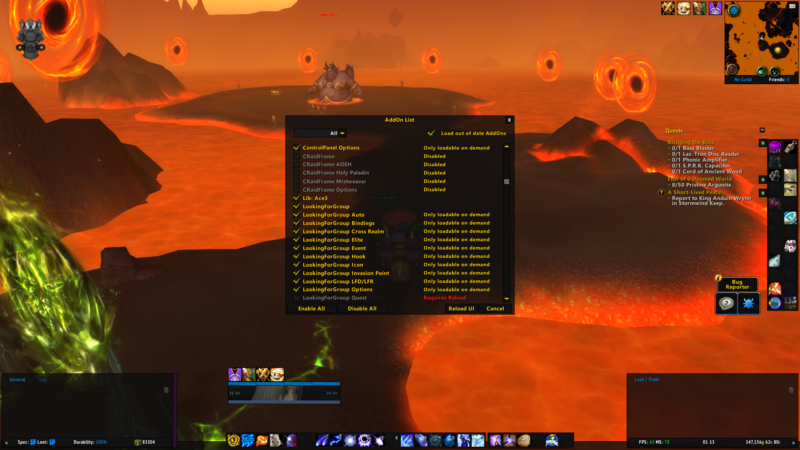 my screen showing that theres no queued for it, and the chat where my party asks why i'm not inviting a 405 healer? I will try reseting everything, tho. 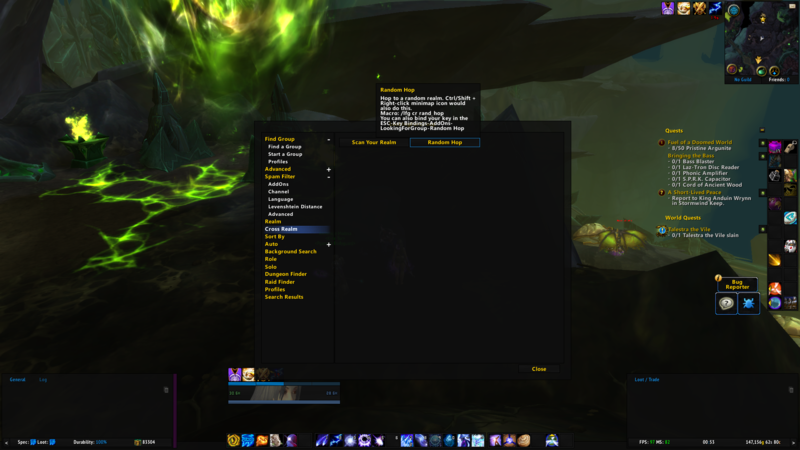 Ok. then show the screenshot of "no queued for it"
Is it possible to temporary disable the LFG addon interface and (temporary) return to Blizzard LFG window without reloading UI? You can try to register all LFGList Frame events and show the frame. However, it will easily taint your UI since LFG has taken the title/description/voice chat/search bar away from Blizzard UI. Blizzard themselves hates addon authors to modify their UI. I was to put an addon which helps you accomplish that. The problem is that people will download that addon unintentionally which would make LFG addon dysfunctional. 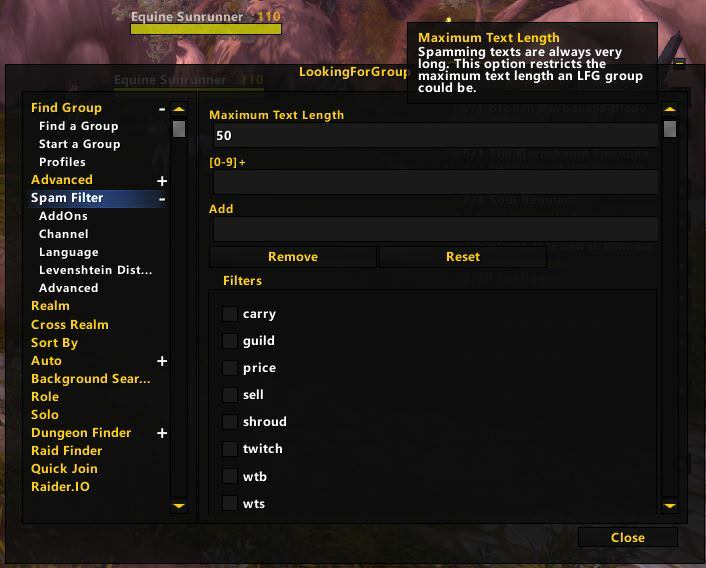 You can write your own LFG sub addon to add filters/auto-groups(like quest groups) as extensions. Is this broken or did everybody stoped using the addon? Ever since the Patch i have yet to find a group or someone who would join me. What do you mean of finding a group? WQ group?? 1. its way too complicated for the average user to use. WQL groups (quest ID groups) are officially dead and I see no quest id groups in my region. That is why this addon now switches to a new WQ method by default. Inputting quest id for twice is just too confusing and hard for 99% of people. tried that already but it also does not work. Are you sure you don't see any 5 digits title groups in quest category of lfg? Then don't enable WQL mode. Either with or without the numbers. Nothing works. Right now there is an Assault and like 30 people are around me but there is still no group open and i cant find anyone to join me.